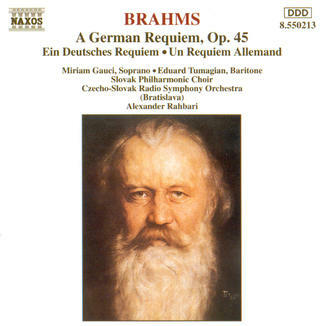 After a brief hiatus, here’s Top Ear’s second comprehensive, this time on 12 different recordings of Brahms’ Ein deutsches Requiem, purely a labour of love of Brahms’ music. The work, whose conception and progress was apparently spurred by the notion of Brahms’ mother’s eminent death as well as a work by Schumann of a similar title, remains to this day one of his finest achievements and testimony of his study in counterpoint, as well as one of the most beautiful choral works ever written. It is also an oft-recorded work; the catalogues are bursting with recordings to suit nearly every taste and style. As such I feel a comprehensive review of this masterwork is necessary to notify readers of the wide-ranging interpretations of the work, and to allow those still new to the work a contextual insight into it (as well as, on a smaller scale, to prepare us for the Ein Deutsches concert in late November, performed by Jaap van Zweden and the Hong Kong Philharmonic). Let me start with the most widely acclaimed version of the work, the classic Klemperer with the Philharmonia Orchestra and Chorus on EMI, with soloists Elisabeth Schwarzkopf and the late Dietrich Fischer-Dieskau. Klemperer’s approach is majestic yet terse, striving for directness and effectiveness, and as would be expected his squareness is everywhere. Of special note is the dark, dry, prominent woodwinds throughout provide an organic edge to the sound that you simply won’t find anywhere else. The soloists’ singing here has yet to be surpassed. Fischer-Dieskau’s crystal clear pronunciation (hear how he relishes in rolling the “r”s in “Herr”!) and full, authoritative tone make wonders with the third and sixth numbers, while Schwazkopf’s creamy yet strong voice projects splendidly in the fifth movement. I have, though, a few reservations. The brass is rather weak when it matters, counterpoint in the fugues could be more well-defined, and the sonics have aged a bit. Nevertheless this is still a classic recording in every sense of the word. And with its most recent reissue in EMI Masters, it needs to be in every collection. 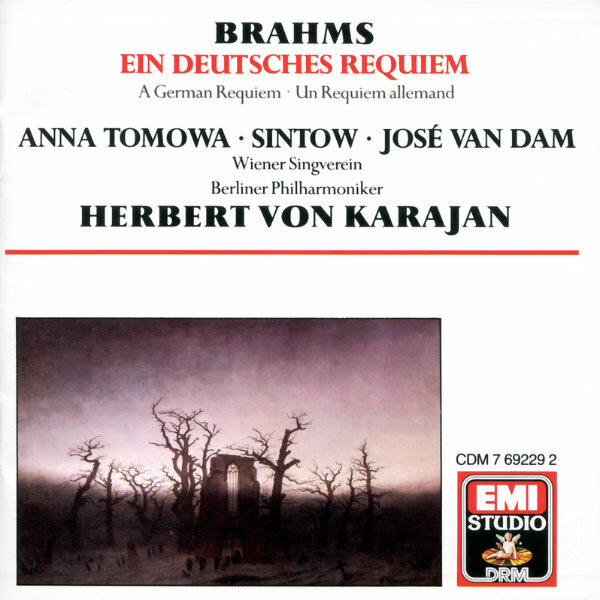 Another EMI offering of the Brahms Requiem is this, Karajan’s 1976 recording with the Berlin Philharmonic and Vienna Singverein, reportedly the best of the numerous recordings of the work he made with EMI and DG, joined by Jose van Dam and Anna Tomowa-Sintow. Here, what we have is a heartfelt account weaved together by the lush BPO tone created by Karajan, with surprisingly powerful brass. Though the choral singing leaves much to be desired, the solo singing is exemplary: Van Dam’s prophetic, weighty voice heralds the third and sixth movements persuasively, and the lush fifth movement benefits from Tomowa-Sintow’s rich and ripe singing. The adequate sonics are clear and natural. And now that this recording is released on EMI’s Encore budget series, it’s well worth serious consideration. Yet another EMI offering of this work is Celibidache’s reading with the Munich Philharmonic and Choir, with soloists Arleen Auger and Franz Gerihsen. As with the case for most of Celibidache’s work, it’s not for everyone. 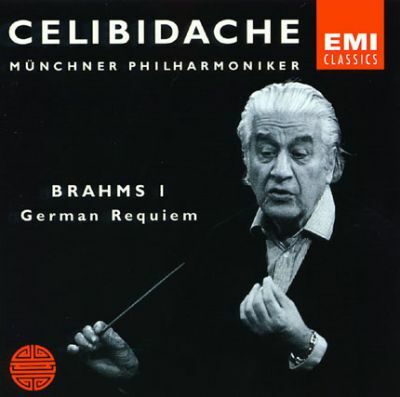 Celi in his Munich years often extracted the creamiest tones imaginable from the orchestra, and here is no exception: his emphasis on spirituality and principle of reverberance of sound (the more complex the harmony and rhythm, the more time it needs to resonate, therefore the slower tempi) result in one of the slowest recordings ever. Celi’s Munich sound works wonders here—the strings have rarely sounded fuller. While Gerihsen’s breathless singing wears out on the ear and the chorus’ intonation problems make the first movement a painful listening experience, Augér’s terrifically beautiful singing in her solo, unfazed by Celi’s unhurried tempi, sort of saves the day. And the tempi, difficult to accept at first, grow on you and turn the listening experience into something truly spiritual. Such stagnant fluidity, if I may put these paradoxical words together, is what makes this recording very special. I bet the live audience was as mesmerized as Celi and his forces were. But speaking of being mesmerized, I was never as mesmerized as I was while hearing Tennstedt’s first movement. The choral entry is really something special—the delicacy despite the London Philharmonic Chorus’ large sonority results in a certain “churchliness” that has to be heard to be believed. A quick look at the timings reveals the dangerously slow tempi Tennstedt assumes (only Celibidache is slower), but it never feels mannered or etiolated. In fact, this recording turns out to be the most spiritual and reverent I’ve ever heard, even more so than the abovementioned Celibidache. While the baritone Jorma Hynninen’s tone is nowhere as rich as Fischer-Dieskau, and the appropriateness of using the great dramatic soprano Jessye Norman as soloist in the delicate and dreamy fifth movement is open to debate, this excellent performance would surely make a very different and very fresh alternative to Klemperer’s classic. 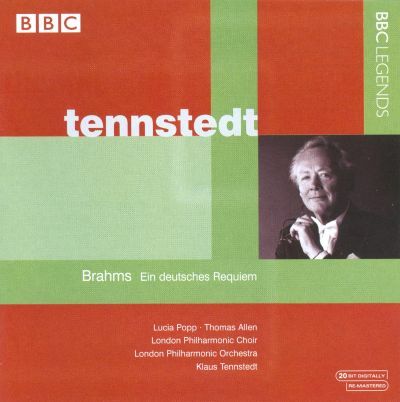 Tennstedt also did one live on BBC Legends at around the same time as he did the studio recording, in 1984, with the same choral and orchestral forces. The soloists, however, have been replaced with Lucia Popp (possibly Tennstedt’s favorite soprano?) and Thomas Allen. The most obvious difference between these two contemporaneous recordings is, unsurprisingly, the tempo. Here Tennstedt is 5 minutes faster overall, surely due to the live provenance; nevertheless, most of the time not an ounce of spirituality of the studio recording has been lost in this live performance. The London Philharmonic is in its old brilliant self, and Popp’s suave tone suits the fifth movement much more than Norman. Thomas Allen is also much stronger and confident than Hynninen. Good but not great sonics (with a bit of tape hiss) round up this very solid and satisfying release, one that would leave first-timers to the work stunned, as I was. 31 years has passed since Karajan’s aforementioned 1976 recording and this one, released in 2007, both featuring the Berlin Philharmonic. And what a remarkable change it has undergone! Textures are clearer, tones leaner and less lush, and much fuller brass. Of course, times change, and so do the principal conductors since that Karajan recording—Abbado, and then the incumbent Simon Rattle. It’s yet again on EMI (it seems that EMI has become the ultimate Ein Deutsches label! ), and it seems both EMI and Rattle have waited wisely to record this, because the results clearly show Rattle’s myriad of cogent ideas: a truly lively “kommen mit Freuden un bringen ihr Garben” in the first movement, crystal-clear, strings balanced towards the celli, and lots of exciting dynamic contrasts throughout. The Rundfunkchor Berlin sounds sinewy, as does Quasthoff and Röschmann (though if anything we could wish for more texture and weight in Quasthoff’s voice). My only reservation concerns Rattle’s somewhat irritating micromanagement habit (as with his Mahler 5th). But this won’t be a big problem for most people, and ultimately this is a muscular, exciting modern version that surely justifies purchase. If it’s a budget recording one is looking for, one does not simply forget available offerings from Naxos, the ultimate budget label. In this 1992 recording, conductor Alexander Rahbari, the Czecho-Slovak Radio Symphony Orchestra and the Slovak Philharmonic Choir is joined by soloists Eduard Tumagian and Miriam Gauci, and the results are, well, pretty mixed. The choir sports a thick and rich texture, and so does the orchestra, but many passages seem too rushed to suit the resonant sound (Celi is such a genius). Strange pronunciation and a hollow, piercing tone mar Tumagian’s otherwise passionate singing, and the over-prominent timpani ostinato in the fugal part of the third movement destroys the rhythmic pulse. Adequate sonics, reverberant and muddy in the bass, do nothing to help the situation. In fairness, it’s not all that bad. The sixth movement’s powerful horns in the climax serves as a clinic to all other recordings on how the sf should sound like, and Gauci’s concentrated, warm tone delivers a relaxing fifth movement. But when all’s said and done, in almost no way is this recording in any respect better than the competition, and even for the budget price, you could do much, much better (the aforementioned Karajan, for example). Pass this one up. This recording is another strong reason why you could get so much more for the Naxos price in this repertoire. Here, Giuseppe Sinopoli and his Czech Philharmonic forces give a lush, piquant performance, one that may not be among the best available, but still withstands the test of time. It’s not perfect. There are a few idiosyncratic moments, and neither the Prague Philharmonic Choir nor the sound engineers are in top form. But then, you will not hear a more thrilling sixth movement anywhere else (those incredible trombone kicks! ), and the speed that Sinopoli takes for all the fugal sections are all the more surprising especially when considering the clarity of counterpoint that still remains. 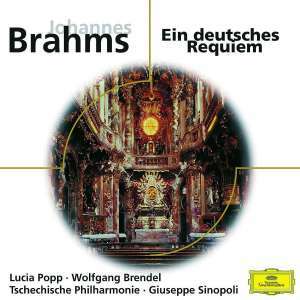 Great solo work from Popp and Brendel, too. Another interesting detail concerns the prominent harp, something lacking in just about every other recording. A recording for the ages. 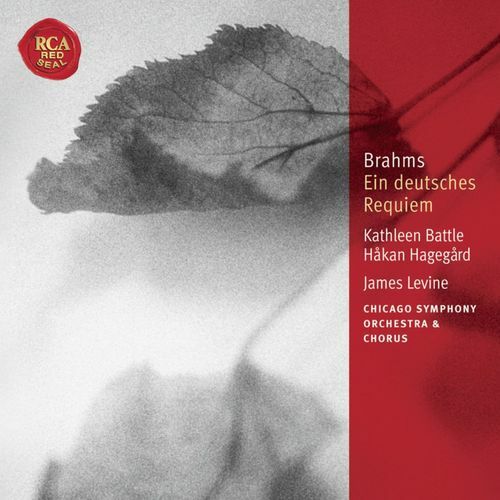 Levine’s 1983 recording with Chicagoan forces could also be considered a budget recording if only because it’s released with his RCA set of Brahms symphonies in a 4CD budget box set (bought separately it’s on the mid-priced Classical Library series, as the photo shows). In an earlier review my colleague Leonard added to the almost unanimous critical praise of the performance of the symphonies, but this Requiem performance is a controversial one, often criticized for the glacial tempo of the second movement (not even Celibidache stretches it so much) as well as a lack of spirituality. However, I say that a search for spirituality in Levine’s approach misses his point entirely, as clearly what Levine wants to express is much more than mere consolation; in fact, he turns out an edgy, alert and exciting performance that is true with his approach to most of what he recorded for RCA during those years (his Mahler, for example). And the slow second movement is perfectly acceptable to me as it does not sacrifice tension, power or gravitas any more than other more fleet-footed performances. As for the other movements: yes, they’re brighter in conception than usual, but who says German Requiems need to be dark and dull? Levine’s performance, then, is individual and luminous, which would be a good reason to have it amongst your other shadier performances. Wonderful solo and choral singing (I just love the baritone Hakan Hagegard’s ripe tone!) and vivid, clear sonics round up this desirable release. Much less controversial, though, is Blomstedt’s San Francisco recording, considered by some to be the best after Klemperer’s classic. And I cannot praise this recording too highly for its sheer beauty and balance of both choir and orchestra, the ravishing soloists, and the thrills generated in the fugal bits and the sixth movement, to say nothing of the gorgeous recorded sound. I guess here I’ll leave it at that and let you discover for yourself the all-enveloping excellence of this recording that leaves even me failed by words. At last, to performances with some historical flavor. Gardiner’s first transversal on Philips, recently reissued on Decca Originals and performed by the Orchestre Révolutionnaire et Romantique, a period ensemble assembled by Gardiner himself, is one of the most famous period recordings of the work. In the booklet notes, Gardiner writes, somewhat audaciously, “The inherent rhythmic vitality and characteristic ruggedness of this masterpiece is often overlaid by a prevailing dinginess of texture and mood […] which is totally at variance with Brahms’ aims and distinctive style.” This credo clearly speaks for itself: Gardiner’s ear for rhythmic vitality and clear textures delivers one of the strongest performances on disc, a swift, exhilarating and muscular presentation, without any sacrifice for delicacy and detail in the moments where it is most needed. As you would expect, the fugues are Gardiner’s sort of thing, and in the calmer passages Gardiner and his orchestra conveys a very special air of tranquility you would be hard-pressed to find anywhere else. Fantastic brass, too. The clean linearity of the (vibrato-less) lines, un-flabby choral singing and crisp timpani bass line resembles Rattle’s performance, though without the micromanagement. And baritone Rodney Gilfry’s voice is absolutely ravishing, Margiono’s over-delicate, weak voice less so. It’s one of the recordings I return to most often, and deserves my highest recommendation. Another performance is by Philip Herreweghe and his French orchestra, this time a historically-informed performance using modern instruments instead of Gardiner’s period performance. The thing is, though, you’d never know it was historically-informed unless you listen really closely. The warm, rich string textures certainly don’t betray the fact that the strings are playing vibrato-less, nor does the full-sounding choir hint at any difference than modern techniques. In fact when it comes to choir-singing, Herreweghe is pretty much unbeatable anywhere, and there’s no exception here: it’s just about the most beautiful choral singing there is on disc, every line and every texture balanced beautifully into one organic unity. The orchestra and soloists are marvelous too, and their performance is captured in the usual great sound from Harmonia Mundi. A remarkable, attention-deserving version. So, which one of the 12 is the best? It’s hard to decide, because all of them have their strengths and weaknesses, and for the listener’s part, it’s ultimately taste that would pick and choose its way through excitement and spirituality, speediness and unhurriedness, modern or period. I myself return to Gardiner most often, as I mentioned, but I wouldn’t want to live without Karajan, Blomstedt or Klemperer’s standard-setting recordings. At any rate, these 12 recordings are not all I’ve heard, and those that I haven’t heard include Solti, Giulini, Harnoncourt, Shaw and the rest of Karajan’s recordings of the work, but I feel that those I didn’t cover here (both of Previn’s, and Barenboim’s) don’t need any special mention. I never intended my review to be inexhaustible, so if you would like anything other than those I mentioned reviewed, please be sure to let me know. I also close with a thank you to Herr Brahms. Categories: Comprehensive Review | Tags: Berlin Philharmonic Orchestra, Blomstedt, Brahms, Celibidache, Chicago Symphony Orchestra, Czech Philharmonic Orchestra, Czecho-Slovak Radio Symphony Orchestra, Gardiner, Herreweghe, Karajan, Klemperer, Levine, London Philharmonic Orchestra, Munich Philharmonic Orchestra, Orchestre des Champs-Elysees, Orchestre Revolutionnaire et Romantique, Philharmonia Orchestra, Rahbari, Rattle, San Francisco Symphony Orchestra, Sinopoli, Tennstedt | Permalink. The Sinopoli recording is just ethereal. Absolutely, Michael. It’s certainly one of my favorite recordings of the work. Shame that the recording quality isn’t great. And I just received news recently that DG will release the Sinopoli recording on its budget Virtuoso series. 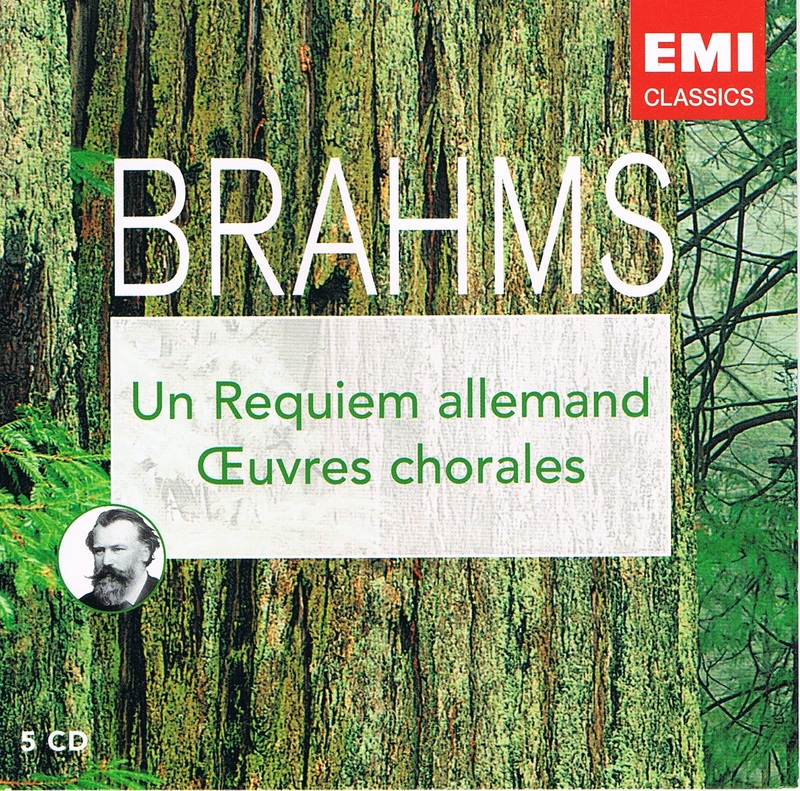 Now this attractive Brahms Requiem is made easier to find. I had only Blomstedt, Klemperer and Rattle until reading this piece and have since purchased the Gardiner which really opened my eyes. I now think Gardiner and Rattle (likely contrary to Brahms intentions) are my favorites. 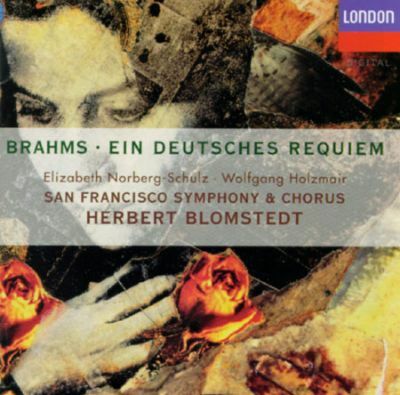 In February I’m attending the requiem in San Francisco with Blomstedt and hope it’s stellar. Nice comparison. BTW, the Orchestre des Champs-Élysées with Herreweghe is definitely on period instruments too. Among the recordings you didn’t cover here, I rate Previn/RPO highly. Completely monolithic, but still overwhelming, and with glorious sound. Karajan’s recording on DG was made in 1964, perhpas only re-issued in 2007 (Karajan died 1989).